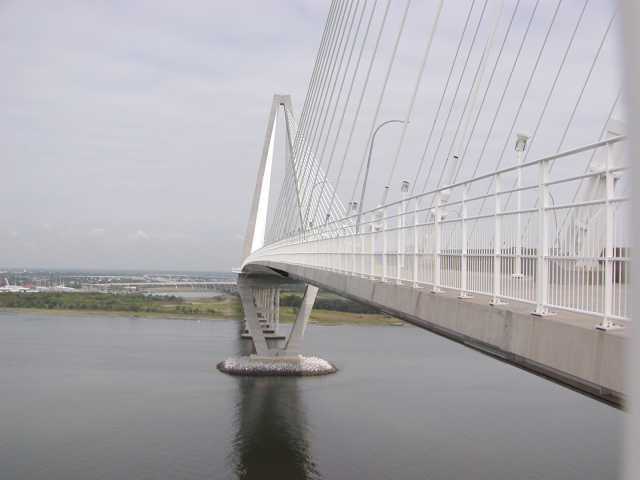 The Arthur Ravenel Bridge is immense. There are 4 lanes of traffic for each direction across the harbor between Charleston and Mount Pleasant. 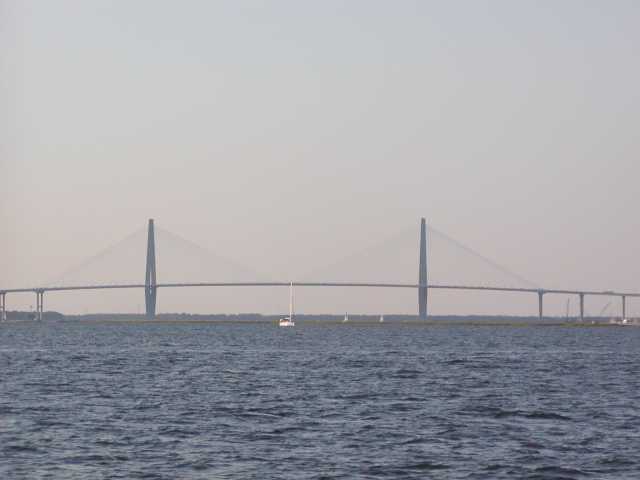 There is a nice pedestrian and bicycle walkway that crosses the bridge where you can find a beautiful view of the harbor and cities of Charleston and Mount Pleasant. There is a designated parking area in Patriot's Point that can be used to access the bridge walkway. It is also accessable from Mount Pleasant Waterfront Park. We have walked up the bridge a number of times over the years. It's a great way to work off those large meals, because the food comes at a price! We walked the bridge during our May 2008 Spoleto trip. The view was pretty nice and well worth the walk and exercise. We saw a wide angle view of the penninsula stretching across the harbor into Patriots Points, Mount Pleasant, and beyond. There was a cargo ship unloading at the ship yards. 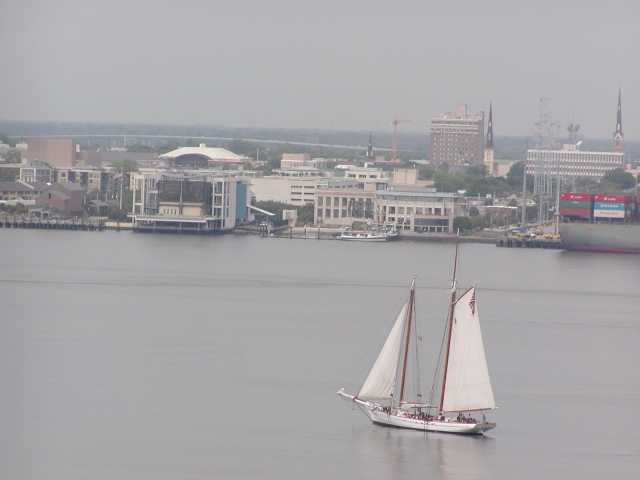 A large sail boat passed under the bridge, heading up the Cooper River. I am a little uneasy with heights. If you contemplate walking up the bridge, be aware that it does shake at the apex of the bridge. There is a large scale shock absorption system built into the superstructure, so this is completely normal and supposed to happen. I still think it was worth it and we'll be doing it again next time too! 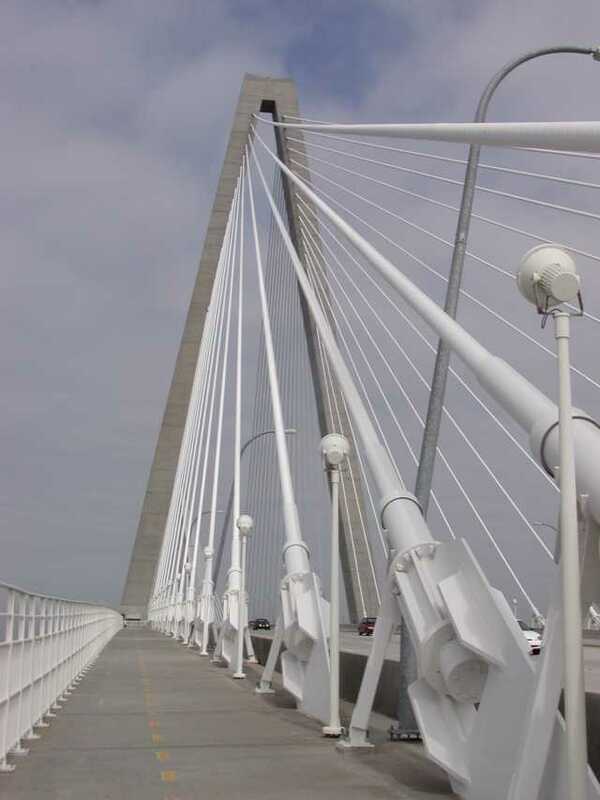 If you're looking for a unique view of the city and surrounding harbor area, you might consider walking the bridge too.